Buying a new flute is a huge decision and a big investment. The blog article below can help you with some common questions. 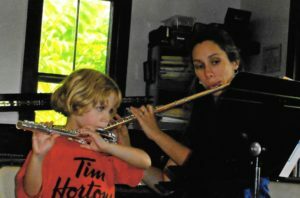 Flutists needing a step-up flute or a second flute. Intermediate-advanced students who are shopping for a piccolo. Each of these purcheses will have different considerations. 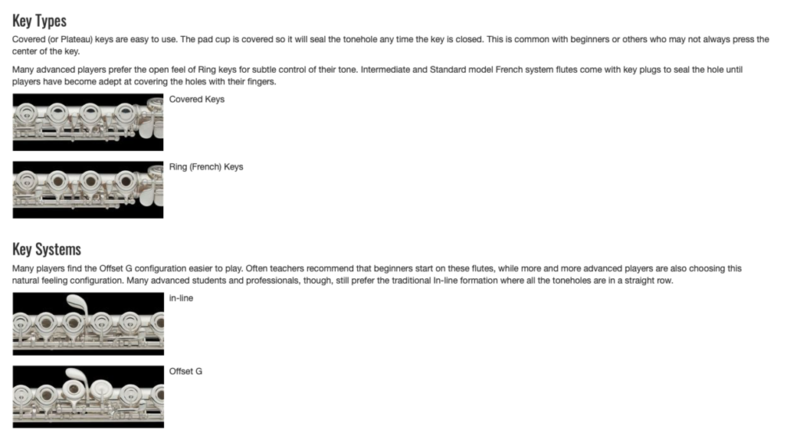 In this article, we will discuss the beginner or student-model flutes. Future blog posts will discuss step-up flutes and piccolos. The first decision when buying a flute will be whether or not you need a “curved headjoint.” As a general rule, the younger the student, the more likely s/he will need a curved headjoint. Most of my students who start lessons before the age of 8 are most comfortable with the curved headjoint. Their arms are simply not long enough to stretch and hold the regular flute. In the picture below, my daughter, who was 6 years old, is playing with a curved headjoint. Some beginner flutes will have both a curved and straight headjoint in the same case. 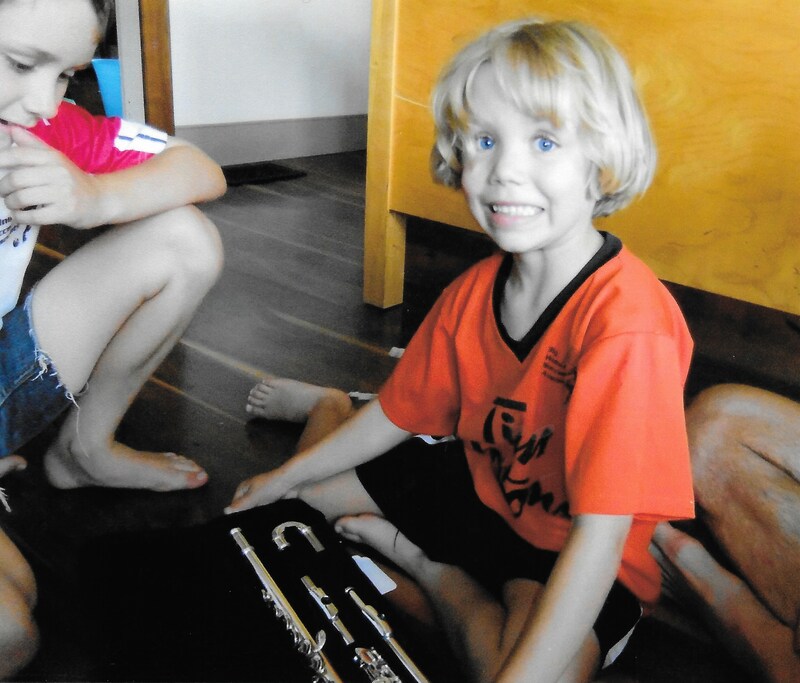 This picture shows my daughter’s Trevor James flute with both curved and straight headjoints in the case. 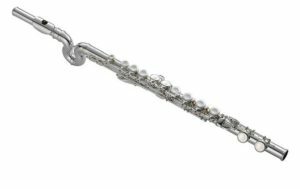 Most beginner flutes will be made of a brass alloy coated with either silver or nickel. I prefer silver because it is shinier and easier to hold, but nickel is cheaper. Nickel finishes have a slippery feel and are darker than silver, but they do not tarnish in the same way as silver. Regardless of the exterior plating. to keep the price low, manufacturers will use a metal alloy throughout the flute, including the headjoint, keys, and mechanism. More expensive flutes will have more solid silver parts. Two manufactures – Guo and Nuvo – are offering flutes made out of plastic. The tone is noticeably less rich than a metal flute, but they have the advantage of being undamaged by water. To me, the Nuvo flutes feel strange in the mechanism and the pads are squishy, but the Guo flutes are quite impressive. The Guo flutes are much more expensive, however. The best key system for beginners and anyone with small hands is “offset G.” This keeps the fingers in a more ergonomic position. It adds some weight to the mechanism, but the benefits far outweigh this minor inconvenience. Most professional flutists that I know play with “offset G.” It’s not a dealbreaker if the flute you love is “in-line” because there are ways to work around this, but all other things being equal, get the offset model. Split-E Mechanism– this is being offered on some student model flutes. It facilitates the playing of some intervals on the flute. I don’t think it’s necessary on a student model flute, but it is helpful. The downside is that this adds extra weight and one more place of adjustment on the flute. 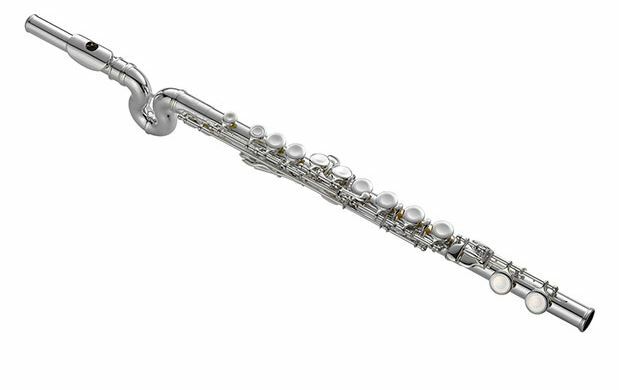 Low B footjoint– most student flutes will have a “Low C” footjoint, which means that the lowest note it can play is middle C. Intermediate and professional flutes will almost always have one extra key and they can play one note lower. Most young students will never have to play a low B and the extra weight at the end of the flute can make it that much more difficult to hold the flute. The “C footjoint” is advisable for most beginner players. Gold plating– some student model flutes will have gold plating on the lip plate or crown, but this is cosmetic and doesn’t do anything for the tone of the flute. Unless you are allergic to silver, there is no compelling reason to pay more for a gold lip plate. Recently, some inexpensive flutes have come on the market. These are being sold on Amazon for as little as $55.88 (as of Jan. 2019.) Manufactured in China, these flutes may or may not be delivered in playable condition. I have had a couple of students purchase these flutes and have been discouraged when they go out of adjustment. The general consensus is that these flutes are not repairable. You will have to throw them away as soon as something goes wrong with the mechanism or they need new pads. Whenever possible, play a flute before you buy it. Involve a teacher or flutist. Many teachers enjoy helping their students (I know I do!) and want them to have the best flute they can afford. Be wary of deals that seem too good to be true. When it’s time to upgrade your flute, check out my blog posts on intermediate flutes and piccolos.